The meatballs come from the Urban Poser and they are delicious! They work great as a party appetizer or a main course with a side of mashed faux-tatoes. 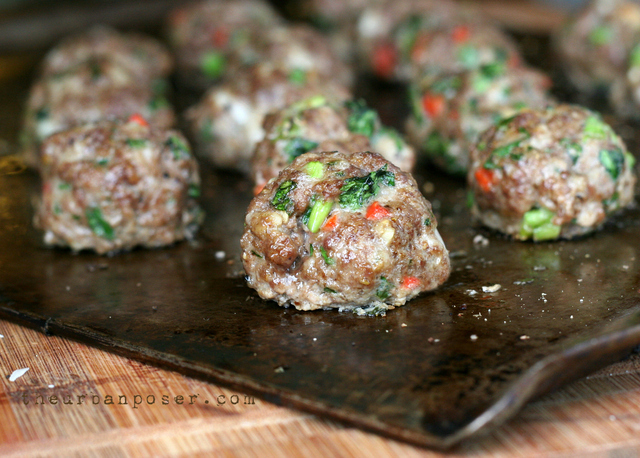 Make golf ball size (or larger) out of the meat mixture and place them about 1 inch apart on the prepared cookie sheet. Serve and eat. Great over spaghetti squash or zucchini noodles, and paired wonderfully with mashed faux-tatoes.